"Trendy and tasty, this skillet recipe is a simple and delicious way to prepare flank steak...and the flavorful sauce is absolutely divine!" Heat 1 tablespoon oil in a 10-inch skillet over medium heat. Add the beef and cook until well browned on both sides until desired doneness, about 10 minutes for medium-rare. Remove the beef from the skillet. Heat 1 tablespoon butter and the remaining oil in the skillet. Add the mushrooms and cook for 5 minutes or until tender, stirring occasionally. Add the shallot, garlic and rosemary and cook and stir for 30 seconds. Stir in the concentrated broth, water and remaining butter and cook until the butter is melted. Cut the beef diagonally against the grain into thin slices. Serve the mushroom mixture with the beef. Recipe Note: Slicing the beef on the diagonal, against the grain, makes this traditionally tough but flavorful cut of meat more tender. Ingredient Note: If you decide to use skirt steak for this recipe, you may need to cut it into 4 pieces to fit it into the skillet. If the pieces crowd the skillet, cook them in batches to ensure the best browning. Delicious! I substituted the beef broth for some Heinz Homestyle Savory Mushroom gravy and water which made a thick and very savory sauce! Pretty good. I usually don't make steak, but gave it a shot tonight. I only used one packet of beef broth and used soy sauce. I'll try two packets next time. This meal was both easy to prepare and delicious! I followed the directions exactly except for the fact that I did not have fresh or dried rosemary. It was a hit in my house served over rice. Looks great!! 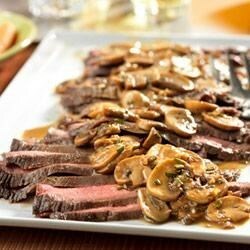 Trying this recipe tonight.... My man loves mushrooms so we shall see. Almost ready to eat... smells great. Enjoyable and easy meal. Subbed onion for shallot and beef boullion for the concentrated broth. The sauce for this was fantastic, however I would prefer the steak on the grill, but by doing that you wouldn't get the fabulous juices to make the sauce.